The question of the representation of a place in a sound production has always interested me. As part of the curation of this series, I decided to investigate this issue by proposing twelve works, which, in one way or another, refer to a location and more specifically to the ambient sound of a space, the Room Tone. We need to see how this theme is interpreted. What form does it take? How is it translated into sound art works? The works (I have chosen) bring about a broad range of interpretations for the term Room Tone in which the ambient sound seems as much a central figure as it is a peripheral one. Each work provides an acoustic point of view through a sound recording which can revive memories, create a portrait of a place and make palpable the simultaneity of moments of life, or that is a technical recording created within the context of shooting. Whether it appears as ghostly presences, it acts over time via temporal reorganization, it revisits history, or it draws the ear towards the hidden sounds of objects through diversion or by suggestion: it allows the interior of the sound or the inner voice to be heard; one is there in the presence of the Room Tone. One is impregnated with the suggestion of a place or a reality, bathed in the color of acoustics, and subjected to our own perceptions of the experience of the present moment. lt is necessary to remember that behind each of these works, there is a sound designer, a sound engineer, a sound artist, a composer (always the first listener) who directs the attention of the listener where he wants it and who seeks to sharpen his perception and even to manipulate it. Ambient sound is what we call in the field of cinema, room tone. This term refers to a sound recording of the environment within the location. The recording usually takes place rapidly at the end of a scene. The soundman requests that the team (all of those present on the film - filmmaker, script-writer, technicians, actors) cease all activity and is silent for a period ranging from 15 to 90 seconds. 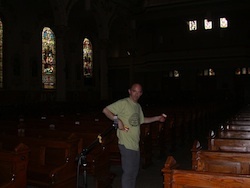 A pause where the soundman will capture the sound ambience of the location of the scene that has just taken place. This operation is repeated for each change of setting or decor. This allows the sound designer to provide the audience with the sound environment of the scene, which has just happened. The Room Tone captures the subtle state that personalizes a place. 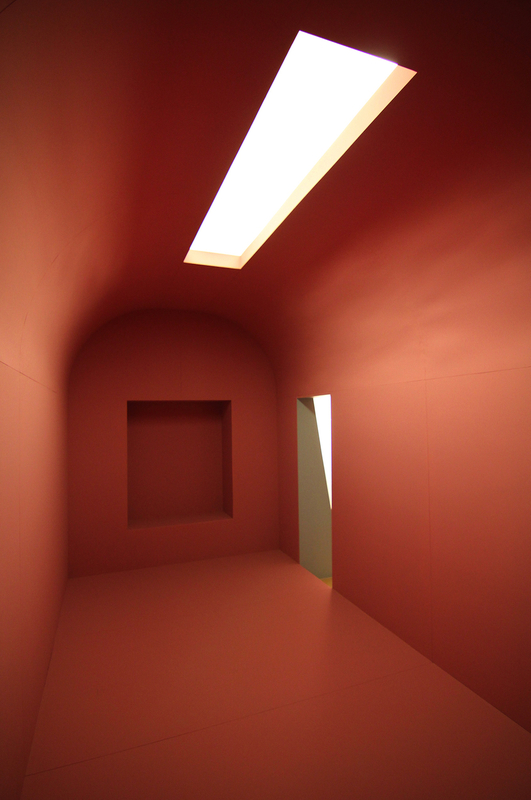 It is the acoustic environment of a place, its color, the tone space. One also speaks in terms of presence. A space is distinguished from another space by its acoustic characteristics. For example, the reverberation will react differently if the room is empty versus furnished. In the first context, the sound will rebound freely from one surface to another (window pane, wood floor, wall and ceiling) until its energy is exhausted; whereas in a furnished location, say a living room furnished with couches, carpets and wall-hangings, the sound will quickly be absorbed by the non-reflective materials. The sound of an environment is coloured by the appliances, which function within it, such as the refrigerator, the air conditioner, a hard drive. Sounds from outside can also be heard through the walls or through a half-opened window. Everyone has heard the sound of a passing truck in the street even through closed windows. In the field of audio-visual post-production, the sound of the environment is used as part of the whole, to clean up the dialogue, to erase unwanted noise produced by the mouth (tongue, teeth, breath) or the intruding sounds from outside of the scene which could harm the intelligibility of the text. It can also be mixed in with a scene as needed. Its function is specific: the room tone allows verisimilitude. The absence of this ambience is immediately perceived by the ear. This disturbance of the sound will be analyzed as if it is a change of location and will lead the listener to look for direction, revealing that the sound is not consistent with the action in progress. There is a strong interrelationship between a place, the perception of space and technology. 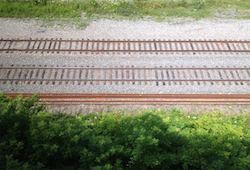 The collection of the sounds of an environment requires a technological intermediary. The chain consists of a set of apparatuses in which the microphone occupies one end and loudspeakers the other. This technology gives access to a different space without any need to occupy it at the time of listening. Some artists will adapt this idea of the technological chain by regarding the body as an instrument of mediation. “I wanted to use myself as a microphone of inaudible frequencies and translate what they produced in me subjectively”, said Eric Létourneau. The question of the instrument and by extension that of the device used by the artist at the time of the production of their work (or of its parts) is of particular interest to us because it is part of an overall design. Each artist uses a more or less complex technology, setting up a device that meets their needs and that creates a context which allows the emergence of the work. A work takes shape from a set of constraints. 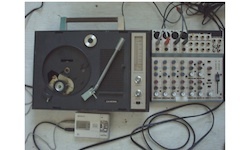 Martin Tétreault reduces his instrumentation to a minimum number of elements (a turntable/radio, a computer microphone, a microphone that captures electromagnetic waves, a small motor and mini-disc). He enjoys diverting the primary function of the turntable (to play a disc) and explores the inside of it. He scrutinizes the mechanical rhythm, seeks its color, the sound environment of the internal space of the machine. This change of scale reveals a noisy macrocosm hitherto unnoticed. With her work DelayToys, Nancy Tobin turns toward the sound universe of early childhood. She invited some people to return to the scene of their childhood (basement of a house, park, church, bath). There, she offered them two suitcases filled with toys from the Seventies with which they played and improvised game-sequences (séquence-jeu) while playing with the toys, which were recorded and which provide all of the sound material for her work. These sound recordings imbue the character and the acoustic quality of each visited site. The work of Steve Bates centres on two themes: the sound resonance of electronic frequencies and the transmission of the signal. The electronic frequency of the Room Tone is between 50Hz and 60Hz, according to the region of the world, which is one of the components of the ambient sound base of all zones where electricity is distributed. Concertina (Site Operations) is a Re-Mix of a performance presented within the framework of the series Ghosts of Public Space curated by Eric Mattson. As Bates explains it to us, he uses frequencies that represent the electrical frequencies and their octaves. Similar notes were played on the concertina accordion. The performance used recordings he had created using wire fencing as an antenna for low-power FM broadcasts. 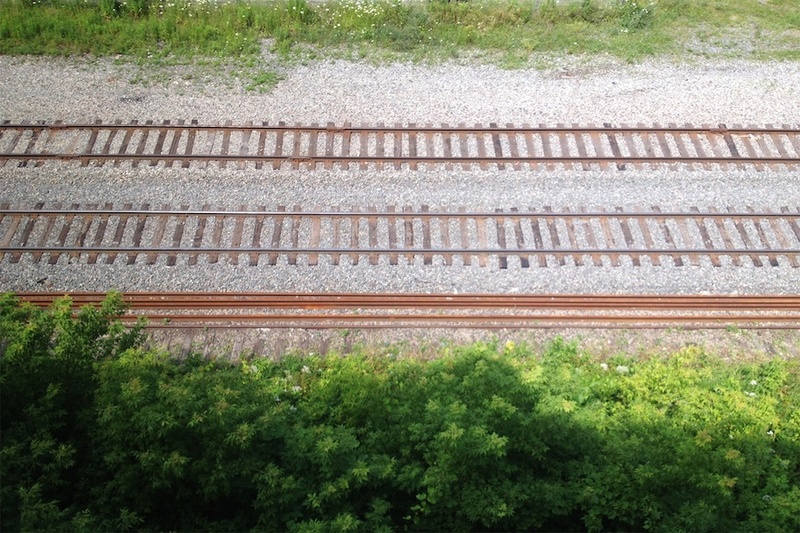 The site in which the recordings took place was a fence that barricades pedestrians from crossing railway tracks near his studio in Outremont (Montreal neighbourhood). Every couple of days people cut holes in the fence in order to be able to cross and a few times a week workers would reinforce the fence to prevent them from crossing. It is an ongoing battle. Christian Bouchard chooses to capture by microphone, the rhythm and the sound diversity of the city through the interior of a vehicle. He seizes the overlapping of moments of life, which evolve in parallel. The minivan is the point of observation of urbanity where interior space is penetrated by the exterior. 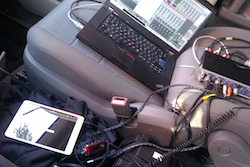 The acoustic processing of the interior of the minivan colours the sound. In spite of the stationary position of the sound recorder, this sound portrait brings the listener back to the function of the vehicle; mobility, displacement, the crossing of other spaces. Les objets (re)trouvés by Mario Gauthier begins with the technical comment of Monique “Room Tone, interior living room for apartment” and ends in the word “end.” Between these words flow 3 minutes and 40 seconds, duration that may seem excessive for a sound recording of a room tone but is just enough time to allow the composer to enter the field of white noise and to manufacture an inner soundscape, a delicate musical fiction taking form out of the documentary foundation. The mise en scène imagined for the spectacle of dance 63 apparitions was this one: a place where five characters will have to cohabit the same space for 63 minutes, without having any interaction between them; five character soloists which haunt the same space, each one of the soloists plunge into his imaginary world and his own spatio-temporality. The works by Magali Babin take as a starting point the instruction of the artist Stephan Gilot for the work Pièce pour cinq interprètes, lumière rose et silence, a constructed space that is monochromatic and uninhabited. In answer to the imaginary exploits of Gilot, Babin injects non-essential sounds at a low noise level, which she mixes indiscriminately with ambient acoustics. It lends itself to listening to an exhibition space when the half-opened door lets sounds from outside infiltrate in and mix with the gallery sounds: steps in a corridor, a plane crossing the sky. The location of listening suggested to the listener is from a room nearby, out of range of the action but witness to the presence that it surrounds. In this way, Babin underlines the fleeting of the moment. 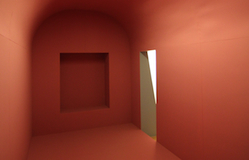 In between is a reinterpretation of the material diffused within the space of the exhibition. The poem by Fortner Anderson begins with the phrase: “There is a false quiet where you come have to rest.” As of the first line, a tension between reality and the perception of this reality is palpable. The poem is inhabited by schizophrenia, where the hallucination of voice and sounds strike the real sound environment without being able to grasp the perceptual boundary between what is constructed and what is reality. The tension is found in a play between the words called by the voice of the poet and the sound universe that has been created. André Éric Létourneau invites the listener to a Huis Clos a play that takes place in a single location]. 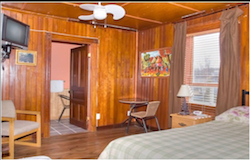 One is in a room at the Robertson House INN located at Mashteuiatsh (Qc), an Amerindian reservation. The room tone is the aboriginal spirit that inhabits the place. In this Inn one finds a series of fur and hunting trophies in quantity. The animal staging, subtle presentation, is Aboriginal. The Robertson’s were taxidermists. the inner voice of the reader. There are two contexts where the ambient sound flow intermingles with inner voices. What is the color of the inner voice? What is the acoustic resonance of the voice in the flow of thoughts? How do the inner and outer sound worlds combine? The psychic room tone is a space that has yet to be discovered. Givre by Monique Jean comes out of the Calendar project (www.calendarproject.ca) carried out in collaboration with the choreographer Tedi Tafel. This series of twelve performances in situ, extending over the course of one year, draws its inspiration from the seasonal changes and the cycles of nature as experienced in the city. The piece included by Jean is related to the month of March. Minimalist in nature, the piece develops through fine modifications of noise based material, timbral and tonal vibrations around a few notes. “An artistic process which consists of removing and refining with the desire to achieve the essential,” Jean writes. The listener’s attention is maintained around a solid state of whiteness. It is summoned to its inner movements of contraction, expansion, of crazing. Almost as if Jean sought to provide access to the inner vibration of matter, a frequency which would bear witness to the tension of the opposing forces, caused by changes of state from freezing to thawing. The music of 63 apparitions originated in Socrate by Satie, a work for voice and orchestra or piano (1918). Socrate recounts the last minutes of the philosopher, and describes his death. The work was revisited by John Cage initially with a transcription for two pianos (1944), and a variation for the piano, Cheap Imitation (1969), “using the structure and phraseology of Satie’s music, and chance operation to change the continuity.” As with Cheap Imitation, 63 apparitions is conceived for dance. Côté views 63 apparitions as “a variation of Socrate where he has fun with these three phantoms which appear in the form of musical quotations or structural and conceptual references.” Côté defines an open temporal structure based over pre-established durations whose temporal organization will be modified once in the hands of the choreographers. The ghostly presence is also that of the sound of the piano wrapped in a tinged aura of reverberation of specific acoustic qualities instead of recording. The twelth artist, Alexandre St-Onge is an experimental improviser, a practice that he shares with a good number of sound artists found in this programme. His piece has two versions: OCCULTER/contracter, which is available for listening on the Web and Ovicorcupueeleetiheearn, which will be performed in concert. The work of St-Onge initially requires that he answer questions surrounding set up, technical strategies, then composition and play. His instrumentation is simple and complex at the same time. Alexandre works in situ. While being well anchored physically in the space where the performance takes form, he explores the idea of temporality, memory and spatio-temporality. The ambient sound of the occupied space is captured by the microphone. It forms the material, the basic frame on which it builds. Added to this is the layer of fixed sounds. The instrumentation is the body, he says. The data received via the microphones or the acknowledgement of movement, is analyzed via the computer and is used with the deconstruction of the linear temporality (fixed sounds) and will be used for a second time as a temporal reconfiguration. Whereas the performative action unfolds in a room near the concert space, the sound is diffused, spatialized in the concert space, in a contamination and amalgamation of acoustic spaces. The topic of room tone, chosen in order to explore the theme of space and its acoustic life, hinted at interesting prospects. These have been validated. The topic has led us towards subjects such as devices and strategies, the tonality of cities, the mise en scène of space, inner voices and temporality, poetic – historic – structural. The works have also highlighted that at the source of a sound design there is a spatial sound reality that is quite concrete and which draws the ear and the attention of designers. The role of the latter, as Monique Jean underlines it, is to provide and bring to life these new sound experiments for the listener. It is what this sound and musical journey offers to you. La question de la représentation d’un lieu dans les productions sonores m’a toujours intéressée. Dans l’exercice de ce commissariat, j’ai décidé d’investiguer ce sujet en proposant douze oeuvres qui d’une façon ou d’une autre font référence à un lieu et plus précisément au son ambiant de cet espace, le Room Tone. Il nous faut voir comment ce thème est interprété. Sous quelle forme surgit-il? Comment se traduit-il dans les oeuvres? Les oeuvres ouvrent un éventail d’interprétations du Room Toneoù le son ambiant apparaît autant comme figure centrale que sujet périphérique. Que la proposition donne un point de vue acoustique à travers une prise de son qui ravive des souvenirs, qu’elle fasse le portrait d’un lieu et rende palpable la simultanéité d’instants de vie, ou qu’elle soit un enregistrement technique réalisé dans le contexte de tournage. Qu’elle fasse surgir des présences fantomatiques, qu’elle agisse sur le temps par réorganisation temporelle, qu’elle revisite l’histoire, que par détournement elle attire l’oreille vers le son caché des choses ou encore par suggestion qu’elle fasse entendre l’intériorité du son ou encore la voix intérieure, on est là en présence du room tone. On est là imprégné d’un lieu suggestif ou bien réel, baigné dans la couleur des acoustiques, assujetti à nos propres perceptions de l’expérience du moment présent. ll faut se rappeler que derrière ces oeuvres, il y a un concepteur, preneur de son, artiste sonore, compositeur (toujours le premier auditeur) qui dirige l’attention de l’auditeur là où il veut et qui cherche à aiguiser sa perception et voire à la manipuler. Le son ambiant est ce que l’on nomme dans le domaine du cinéma, le room tone. Ce terme réfère à une prise de son d’ambiance du lieu de tournage. L’enregistrement se déroule habituellement rapidement à la fin d’une scène. Le preneur de son demande à l’équipe (tous ceux présents sur le plateau - réalisateur, scripte, techniciens, comédiens) de cesser toute activité et de faire silence pour une durée variant de 15@ 90 secondes. Un temps d’arrêt où le preneur de son va saisir avec la perche, l’ambiance du lieu de la scène qui vient de se dérouler. Cette opération sera reprise à chaque changement de décor ou de location. Le room tone capture l’état subtil qui personnalise un lieu. C’est l’ambiance acoustique d’une pièce, sa couleur, la tonalité d’un espace. On parle aussi en termes de présence. Un espace se distingue d’un autre par ses caractéristiques acoustiques. La réverbération par exemple réagira différemment si la pièce est vide ou au contraire meublée. Dans le premier contexte, le son vivant va rebondir librement d’une surface à l’autre (vitre, plancher de bois, mur et plafond) jusqu’à ce qu’il ait complètement dissipé son énergie. Alors que dans une pièce habillée, disons un salon meublé de divans, tapis et tentures, le son sera rapidement absorbé par les matériaux non réfléchissants. L’ambiance d’une pièce prend la coloration du son produit par les appareils qui y sont en fonction tels un frigo, le système de climatisation, un disque dur. Le son extérieur arrive aussi à s’immiscer à travers les murs ou une fenêtre entre-ouverte. On a tous déjà entendu le passage d’un camion dans la rue même les fenêtres fermées. Dans le domaine de la post-production audio-visuelle, le son d’ambiance est utilisé au montage pour nettoyer le dialogue, effacer les bruits parasites produits par la bouche (langue, dent, souffle) ou encore les sons intrus extérieur à la scène qui pourraient nuire à l’intelligibilité du texte. Il pourra aussi être mixé à une scène au besoin. Sa fonction est spécifique, le room tone permet la vraisemblance. L’absence de son ambiant est immédiatement perçue par l’oreille. Une voix plaquée sur le silence technique d’une cabine d’enregistrement ne répondra pas à l’attente de l’écoute. Cette perturbation sonore sera analysée comme un changement de lieu et va mener à une recherche de sens qui va révéler la non cohérence du son avec l’action en cours. Le son d’ambiance a une fonction sensible dans la compréhension du sens. Il y a bien une inter-relation entre le lieu, la perception de l’espace et la technologie. La captation du son d’ambiance nécessite un intermédiaire technologique. La chaîne se compose d’un ensemble d’appareils dont le microphone occupe une extrémité et les haut-parleurs à l’autre. Cette technologie permet l’accès à un espace autre sans nul besoin de l’occuper au moment de l’écoute. Certains artistes vont s’approprier cette idée de chaîne technlogique en considérant le corps comme instrument de médiation. « J’ai voulu me prendre comme un microphone de fréquences inaudibles et traduire ce que ça produisait dans ma subjectivité », dira Éric Létourneau . La question de l’instrument et par extension celle du dispositif utilisé par l’artiste au moment de la production de l’oeuvre (ou de ses parties) nous intéresse particulièrement car il fait partie d’une stratégie. Chaque artiste utilise une technologie plus ou moins complexe, met en place un dispositif répondant à ses besoins et crée un contexte qui va permette l’émergence de l’oeuvre, une oeuvre prend forme à partir d’un ensemble de contraintes. 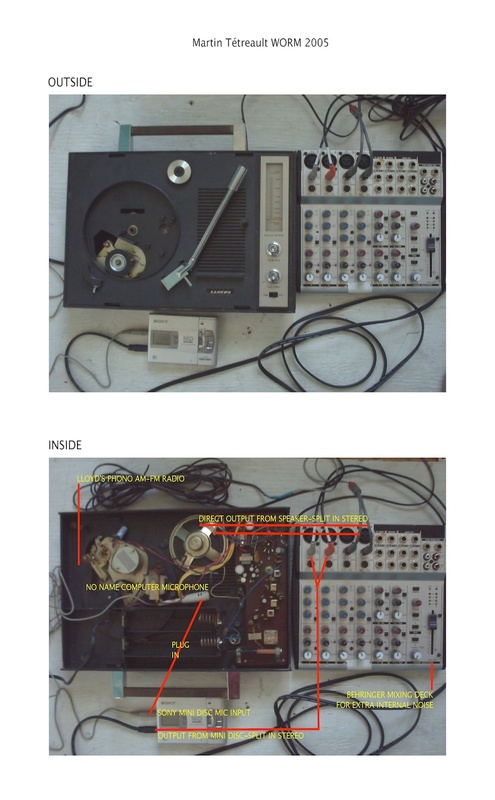 Martin Tétreault réduit son instrumentation à un minimum d’éléments (un tourne-disque/radio, un microphone d’ordinateur, un microphone capteur d’ondes électromagnétiques, un petit moteur et un mini-disque). Il prend plaisir à détourner la fonction première du tourne-disque (jouer un disque) et en explore le ventre. Il ausculte le rythme mécanique, recherche sa couleur, l’ambiance sonore de l’espace interne de la machine. L’amplification permet d’approcher de près le mécanisme interne du tourne-disque. Ce changement d’échelle révèle un macrocosme bruitiste jusque là passé inaperçu. Avec son projet DelayToys, Nancy Tobin part à la rencontre de l’univers sonore de la petite enfance. Elle a invité quelques personnes à retourner sur les lieux de leur enfance (sous-sol de la maison, parc, église, bain). Là, elle leur a offert deux valises remplies de jouets des années 70 avec lesquels ils ont joué et improvisé des séquences-jeu qui enregistrées fournissent tout le matériau sonore de la pièce. Ces prises de son sont porteuses du caractère et de la qualité acoustique de chacun des sites visités. Christian Bouchard choisit de saisir par microphone l’énergie, le rythme et la diversité sonore de la ville de l’intérieur d’un véhicule. Il saisit la simultanéité d’instants de vie qui évoluent en parallèle. La minivan est le point d’observation de l’urbanité où l’espace intérieur est traversé par le son extérieur. Le traitement acoustique de l’habitacle colore le son. Malgré la position stationnaire du preneur de son, ce portrait sonore ramène l’auditeur à la fonction de l’auto: la mobilité, le déplacement, la traversée d’autres espaces. Les objets (re)trouvés de Mario Gauthier commence par le commentaire technique de Monique “Room Tone, intérieur salon pour appartement” et se termine par le mot “fin”. Entre ces mots s’écoulent 3 minutes 40 seconces. Cette durée peut sembler excessive pour une prise de son d’ambiance de plateau de tournage mais elle donne juste assez de temps au compositeur pour lui permettre d’entrer dans la matière du bruit blanc et de fabriquer un paysage sonore intérieur, une fiction musicale délicate prenant forme sur le terrain documentaire. La mise en scène imaginée pour le spectacle de danse 63 apparitions était celui-ci : un lieu où se retrouvent 5 personnages qui devront cohabiter dans le même espace pendant 63 minutes, sans avoir d'interaction entre eux; cinq âmes solistes qui hantent un même espace, chacun des solistes strictement plongés dans son imaginaire et sa propre spatiotemporalité. Le travail proposé par Magali Babin a comme point de départ une commande de l’artiste Stéphane Gilot pour l’oeuvre Pièce pour cinq interprètes, lumière rose et silence , un espace construit monochrome et vide. En réponse à l’action imaginaire de Gilot, Babin injecte des sons anecdotiques à faible niveau sonore et qui se mélangent indistinctement à l’acoustique ambiante. Elle se prête à l’écoute de l’espace d’exposition lorsque la porte entre-ouverte laisse s’infiltrer la vie extérieure à la galerie: pas dans un corridor, avion qui traverse le ciel. La position d’écoute proposée à l’auditeur est celle de la chambre d’à côté, en retrait de l’action mais témoin de la présence qui l’entoure. À sa façon, Babin souligne la fugitivité de l’instant. In between est une réinterprétation du matériel diffusée dans l’espace de l’exposition. Le poème de Fortner Anderson commence par cette phrase: «There is a false quiet where you come have to rest». Dès la première ligne, une tension entre la réalité et la perception de cette réalité est palpable. Le poème est habité par la schizophrénie, où l’hallucination de voix et de sons percute l’environnement sonore réel sans pouvoir saisir la limite perceptive entre construction et réalité. La tension se retrouve dans un jeu entre les mots dits par la voix du poète et l’univers sonore fabriqué. André Éric Létourneau convie l’auditeur à un théâtre. 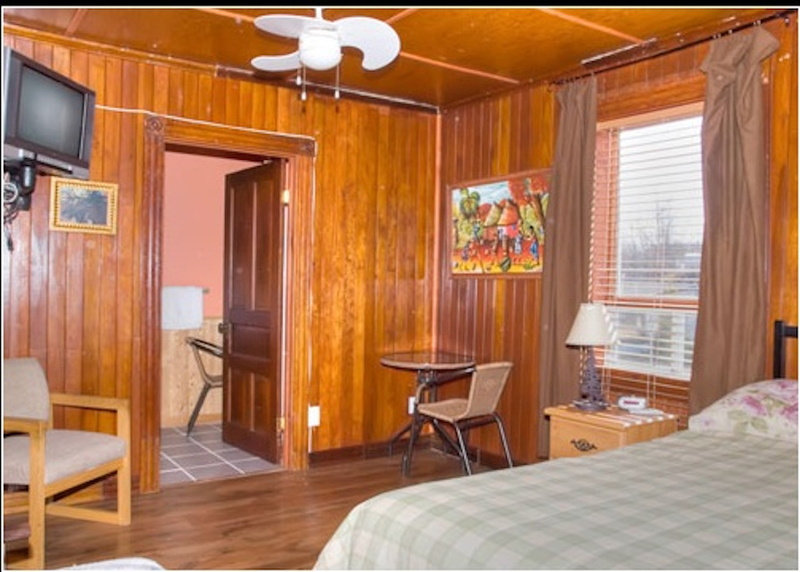 On est dans une chambre de l'Auberge Maison Robertson située à Mashteuiatsh (Qc) , une réserve amérindienne. Le room tone c’est l’esprit autochtone qui habite des lieux. Dans cette auberge on trouve une série de trophées de chasse et des fourrures en quantité. La scénographie animalière, présentation subtile, est autochtone. Les Robertson étaient taxidermistes. À cette ambiance se superpose une scène à trois personnages, deux frères et la mère. On entend des frères mais la voix de la mère est inaudible. Létourneau invite l’auditeur à lire simultanément à l’écoute de la pièce, le rôle de la mère, à s’approprier sa parole. À ce duo étrange se joind donc la voix intérieure du lecteur. Deux contextes où le flux sonore ambiant s’entremêle aux voix intérieures. Quelle est la couleur de la voix intérieure? Quelle est la résonance acoustique de cette voix dans le flux des pensées? Comment les univers sonores intérieur et extérieur se combinent-ils? Le room tone psychique est un espace qui reste encore à découvrir. Givre de Monique Jean découle du projet Calendar (www.calendarproject.ca) réalisé en collaboration avec la chorégraphe Tedi Tafel. Cette série de 12 performances in situ, s’étalant sur une année, tire son inspiration des changements saisonniers et des cycles de la nature tels que vécus en pleine ville. La proposition de Jean est liée au mois de mars. Minimaliste, la pièce se développe en jouant finement avec la matière bruiteuse, le timbre et une vibration tonale autour de quelques notes. «Une démarche qui consiste à enlever et épurer dans le désir d’atteindre l’essentiel», écrit-elle. L‘attention de l’auditeur est maintenue autour d’un état solide de la blancheur et convoquée à ses mouvements intérieurs de contraction, d’expansion, de fendillement. Un peu comme si Jean cherchait à donner accès à la vibration intérieure de la matière, une fréquence qui témoignerait de la tension des forces contraires mises en présence à l’approche d’une bascule de la matière, du changement d’état de gel et au dégel. Les musiques de 63 apparitions ont pour origine Socrate de Satie, œuvre pour voix et orchestre ou piano (1918). Socrate raconte les dernières minutes du philosophe, et décrit sa mort. La pièce est revisitée par J. Cage. D’abord avec une transcription pour deux pianos (1944), et la variation pour un piano, Cheap Imitation (1969), «using the structure and phraseology of Satie’s music, and chance operation to change the continuity» . Tout comme Cheap Imitation, 63 apparitions est conçue pour la danse. Côté voit 63 apparitions comme une variation de Socrate où il s’amuse avec ces trois fantômes qui apparaissent sous la forme de citations musicales ou de références structurelle et conceptuelle.» Côté définit une structure temporelle non fermée basée sur des durées pré-établies dont l’organisation temporelle sera modifiée une fois entre les mains des chorégraphes . La présence fantômatique est aussi celle du son de piano enveloppé dans un halo de réverbération teinté des qualités acoustiques spécifiques au lieu d’enregistrement. Le douzième artiste Alexandre St-Onge est un improvisateur aguerri, pratique qu’il partage avec bon nombre d’artistes sonores réunis dans cette programmation. Sa proposition se décline en deux temps: OCCULTER/contracter qui est disponible pour écoute sur le Web et Ovicorcupueeleetiheearn qui sera donné en concert. Le travail de St-Onge exige en premier lieu de résoudre les questions entourant le dispositif, les stratégies techniques, puis compositionnelles et de jeu. Son instrumention est simplifiée et complexe à la fois. Alexandre travaille in situ. Tout en étant bien ancré physiquement dans l’espace où la performance prend forme, il explore les thèmes de la temporalité, la mémoire et la spatiotemporalité. Le son ambiant des espaces occupés est captés par la microphonie. Il forme la matière, la trame de fond avec laquelle il construit. S’ajoute à cette couche des sons fixés. L'instrumentarium c'est le corps, dit-il. Les données reçues via les microphones ou la reconnaissance de mouvements, sont analysées via l’ordinateur et utilisées à la déconstruction de la temporalité linéaire (sons fixés) et serviront dans un 2è temps à une reconfiguration temporelle. Alors que l’action performative se déploie dans une chambre attenante à l’espace concert, le son se déploie, spatialisé dans l’espace concert, dans une contamination et amalgame d’espaces acoustiques. L’angle du room tone qui a été choisi pour explorer la thématique de l’espace et de sa vie acoustique laissait entrevoir des perspectives intéressantes. Ce qui fut confirmé. Le choix des oeuvres nous a menés vers des sujets tels les dispositifs et stratégies, la tonalité des villes, la mise en scène de l’espace, les voix intérieures et la temporalité, poétique – historique – structurelle. il y a une réalité sonore spatiale bien concrète qui attire l’oreille et l’attention des concepteurs. Le rôle des ces derniers comme le soulligne Monique Jean est de fournir et de faire vivre aux auditeurs de nouvelles expériences sonores. C’est ce que vous propose ce parcours sonore et musical.